Firearms are one of the few things that are still built to last. It is reasonable to assume that a gun bought today, when properly maintained, will still be functional when passed onto your children, or your children’s children. I’d like my guns to survive far into the future, and I think most other gun owners feel that way too. 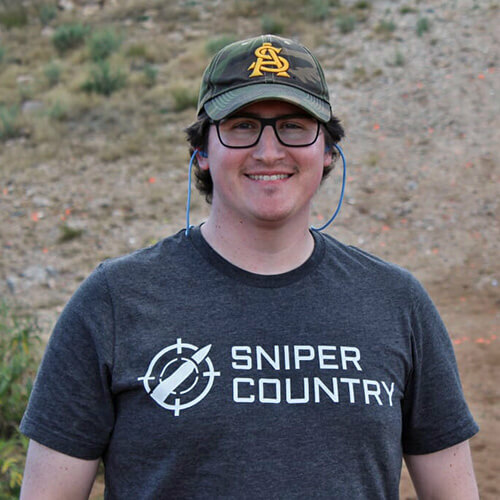 In the short term, a gun that’s too dirty or dry [Best Gun Oils & Greases] to function won’t do any good at the range or in a life or death situation. The M16 was poorly received when it was first introduced, not because the design is bad, but because our troops didn’t have the means or instruction on how to properly maintain them. Cleaning can also start to feel like a chore, since the more guns you shoot, the more time consuming it can become. That’s where a good cleaning kit comes in. 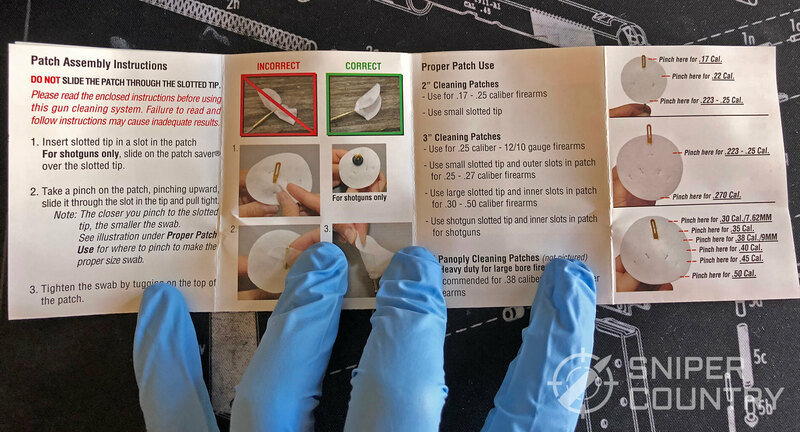 They have all the tools to properly clean your firearms, and in regard to efficiency, blow the old toothbrush and rag method out of the water. 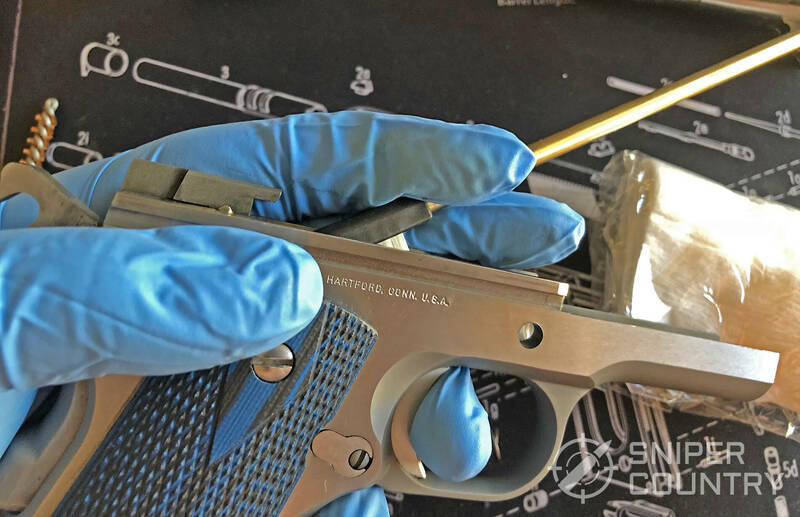 Some kits are tailored for a specific type of gun, caliber or model. Others are more universal, and are worthwhile if you own multiple kinds of guns. 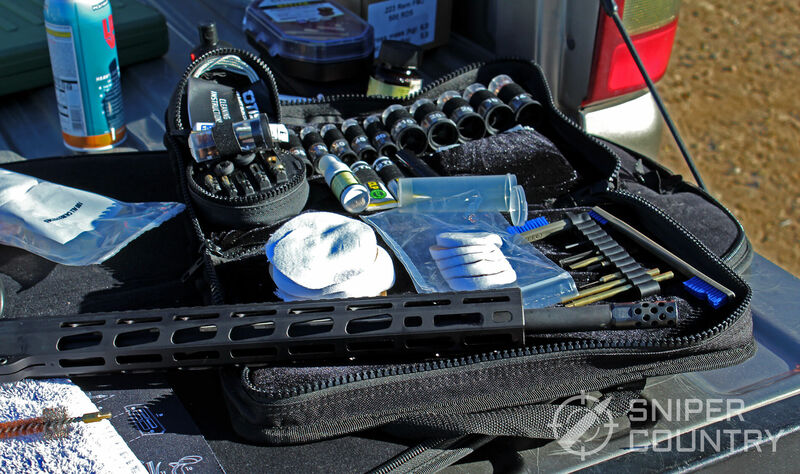 To cover the full gamut, we put several gun cleaning kits to the test, and found the best AR-15 kit, the best pistol specific kit, and the best universal cleaning kits. These are our top picks, and below we have a detailed review of each. 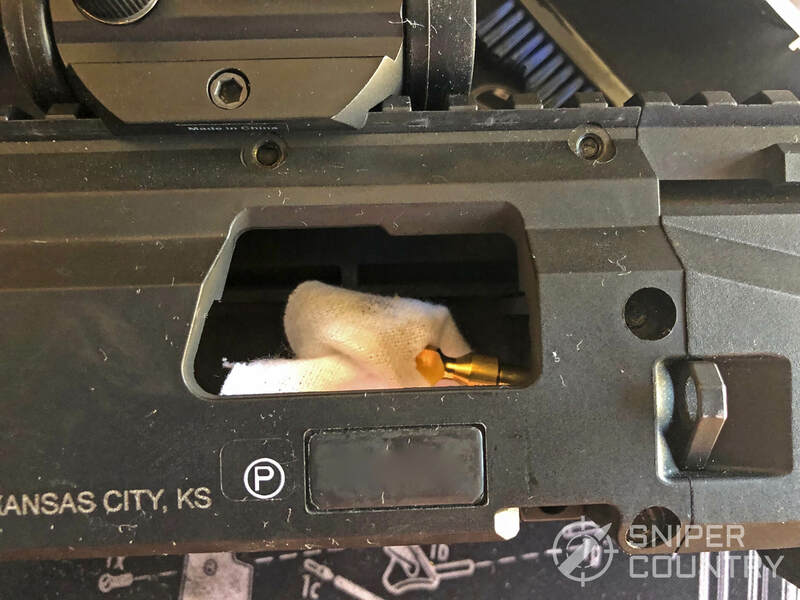 AR-15s are designed to function with a fair amount of crud in them, but that doesn’t mean it needs to be kept that way. 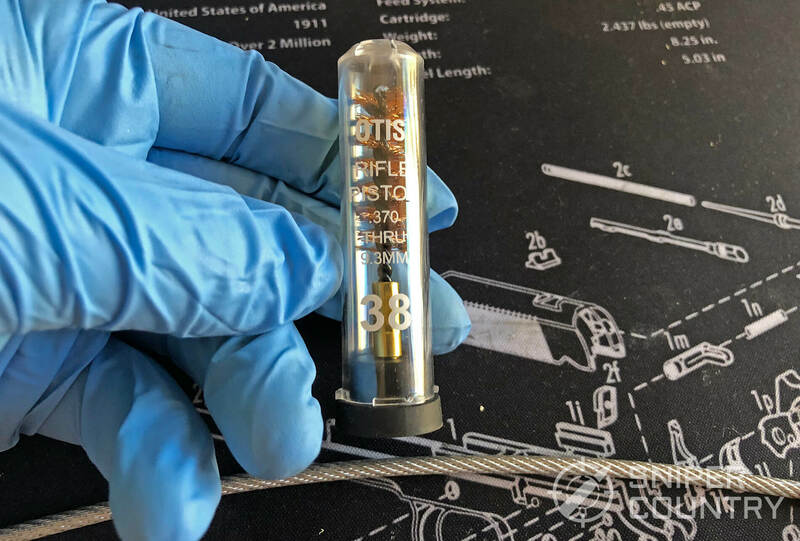 Otis’ original 5.56 cleaning kit was designed with the harsh conditions of combat in mind, and contained a full set of M16/M4 cleaning tools. It was issued by the US military following 9/11, and has been adopted by many government agencies and law enforcement offices. 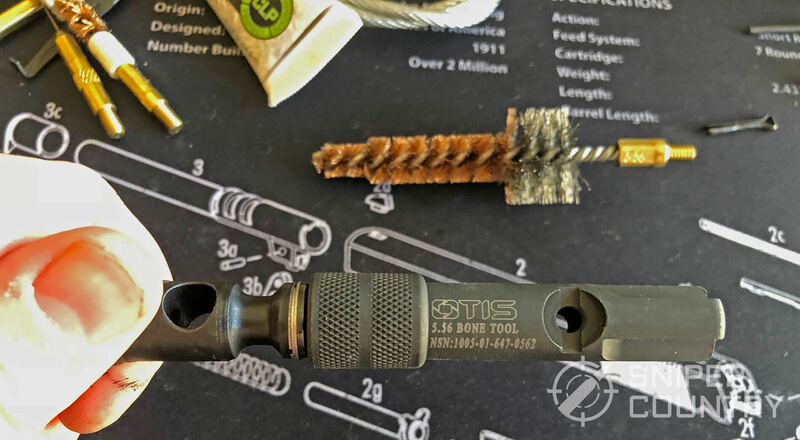 Otis’ AR/MSR kit is the civilian version that expands on that original kit, by incorporating all of the same tools, plus a few extras. It’s also substantially cheaper, which is a big plus in my book. 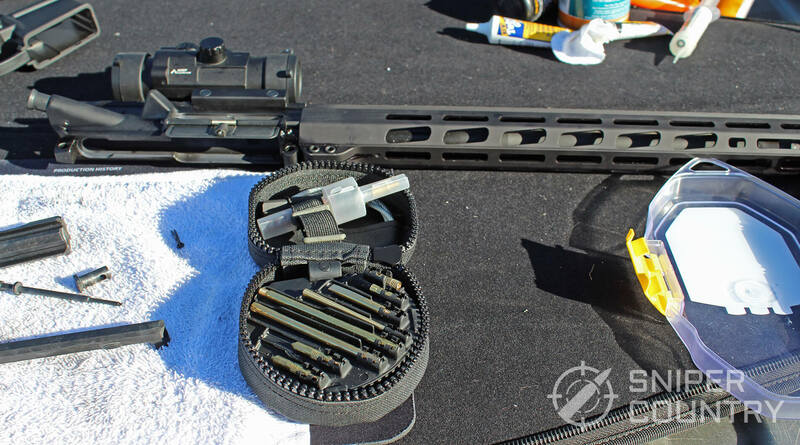 Beyond that, it has some unique tools that set it apart from other AR cleaning kits too, like the B.O.N.E. tool. It has several different kinds of scrapers, picks, and brushes. A chamber flag, cotton patches and a cleaning cloth are also included. A small bottle of their Bio CLP comes with it, and I’ve found it to work quite well. It has the best mix of cleaning, lubricating and protecting of all the CLPs I’ve used. The kit uses a unique flexible cable that acts like a cross between a bore rod and a bore snake. I find it preferable, as bore snakes need to be washed fairly often and usually don’t provide as thorough of a cleaning anyway. 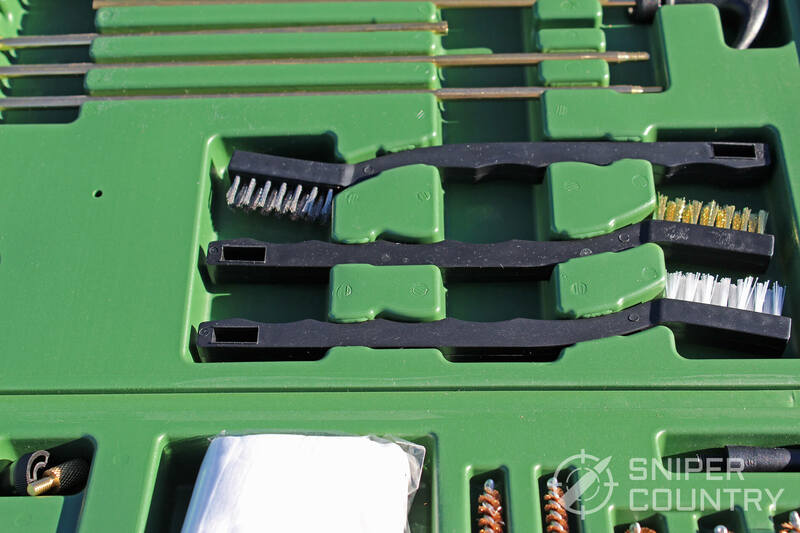 Normal bore rods long enough for a rifle take up more room, even when segmented, and this kit is designed to be compact. Two cables are included, one 30”, and one 8”, so even extra-long barrels will be cleanable. A T-handle is found by lifting the bottom tray up, and can assist in pulling the cable through. I only found it necessary if I left the cotton patch folded a little too thick, or if my gloves were too slippery from the CLP. 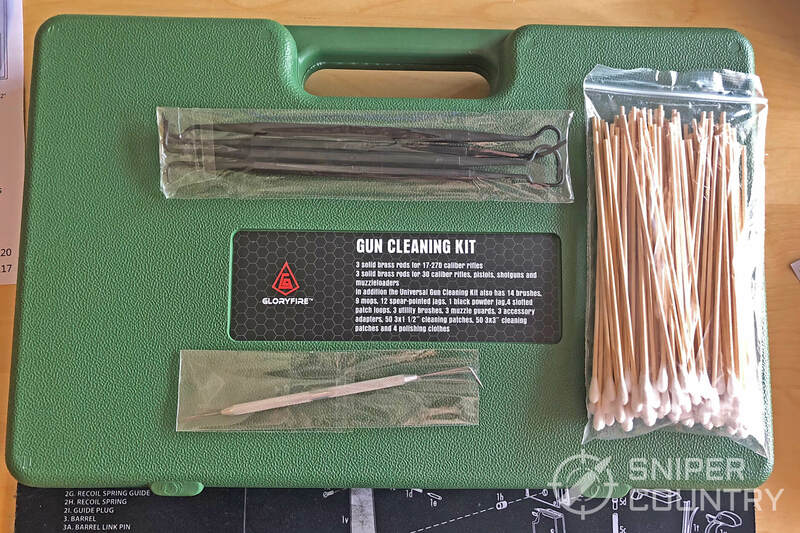 The kit does include two combo brass brushes and swabs, if you do prefer a bore snake type cleaning, which they call Mongoose G2 Brushes. The gray metal tool with the knurled end shown below is the B.O.N.E. tool. 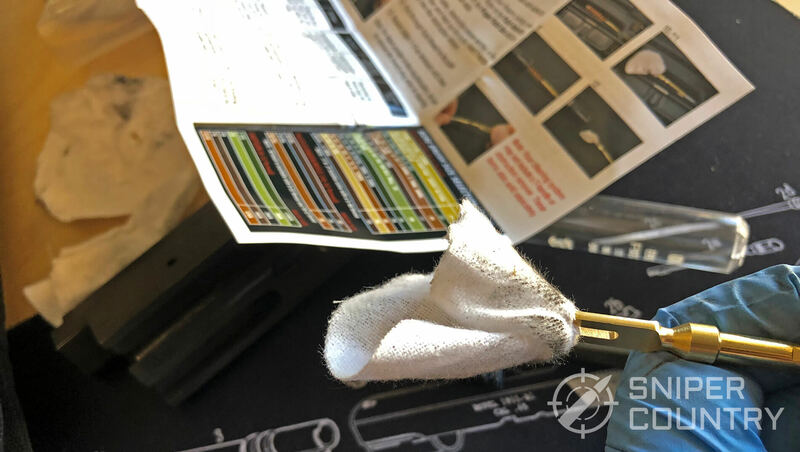 It is a quick and easy way to clean multiple parts of the gun and is a big portion of what sets this apart from other AR-15 cleaning kits. 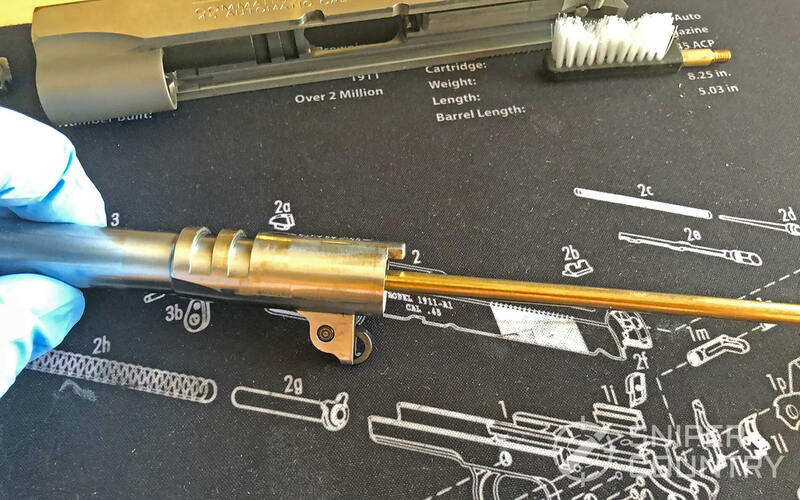 You can use it to clean the bolt, bolt carrier and firing pin. It has internal and external groves that break up carbon deposits, which saves some time and effort. A gentle twist is enough for it to work. I haven’t noticed any scratches from using it, but it is metal, so applying a ton of force probably isn’t advisable. The included brush head attachment is the right size and has the right stiffness to clean harder to reach places. I put a drop of their Bio-CLP on the bristles before using it and found that to be effective. Since it’s just the brush head and not an entire brush, you can vary the length as needed. It all comes in a convenient travel sized pack too, which is great for tossing it in your range bag. Here is the full tool list, shown on the back. 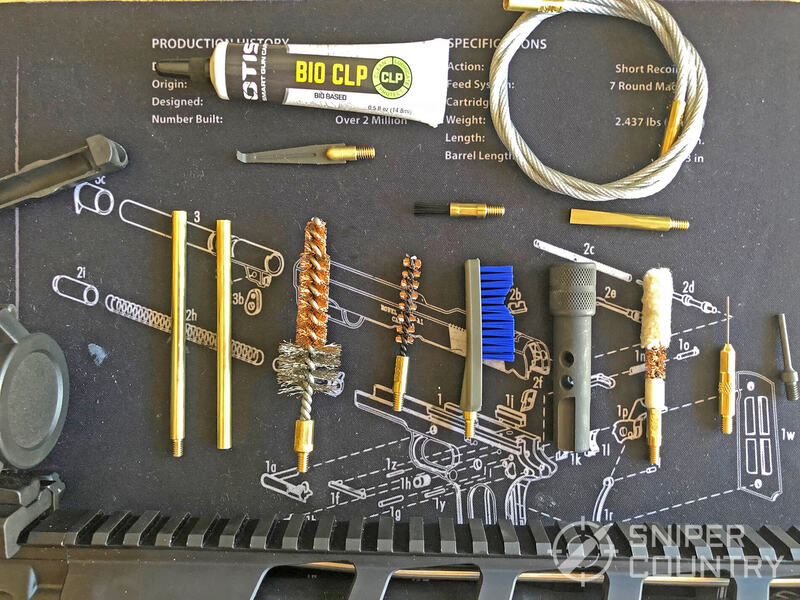 This is a great kit for new AR-15 owners, and it has enough tools to be a good supplement to any other cleaning kit you may already have. 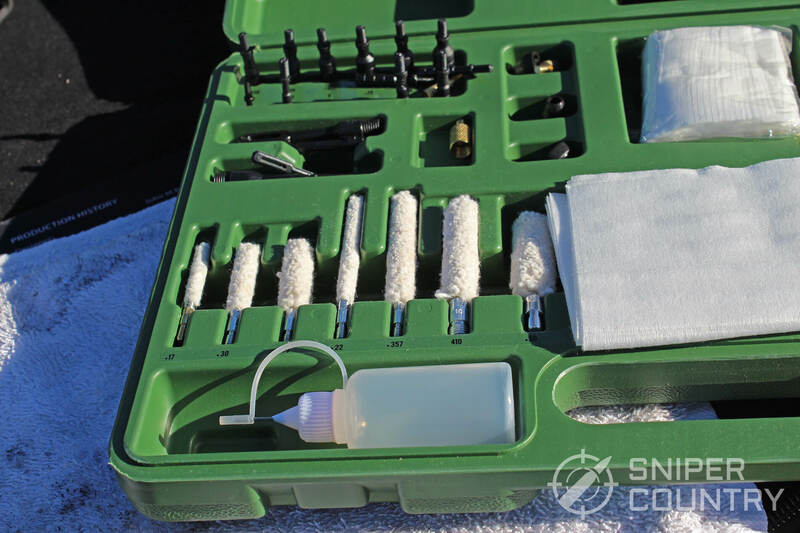 The BootSteady Universal Handgun Cleaning Kit is an inexpensive and compact way to clean all of your handguns. It comes in a small but sturdy hard case that can be zipped up for easy transportation or storage. 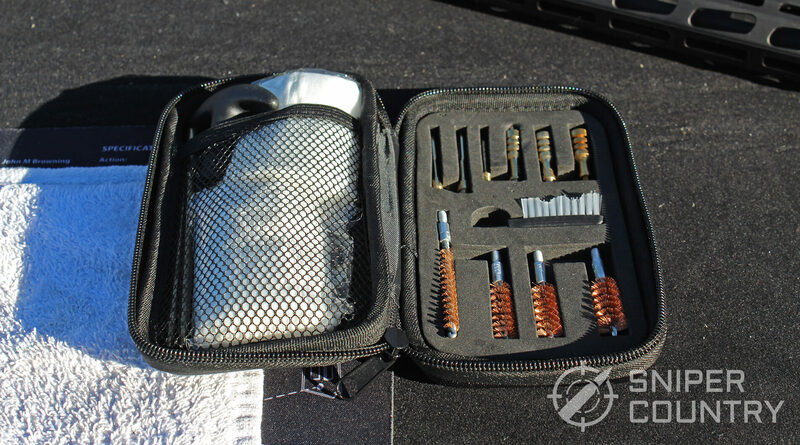 The kit contains all the essentials, like bore brushes (ranging from .22 to .45), spear pointed jags and cloth loops. A rotating T-handle is included, which has two extra sections to extend its length if needed. They should be more than enough for any pistol you own. The brush head screws into the brass rod too, and is thin enough to fit into most spots. The bristles are stiff enough to get the job done, but not so stiff that they launch mini droplets of solvent into the air while brushing. Two large packs of cleaning cloths and a metal pick are also included. The spear pointed jags are wide enough to ensure the cloth stays in full contact with the sides of the barrel, but not so big that it felt like it was scraping against it. The tip is also long enough for the cloth to be folded over and used again. 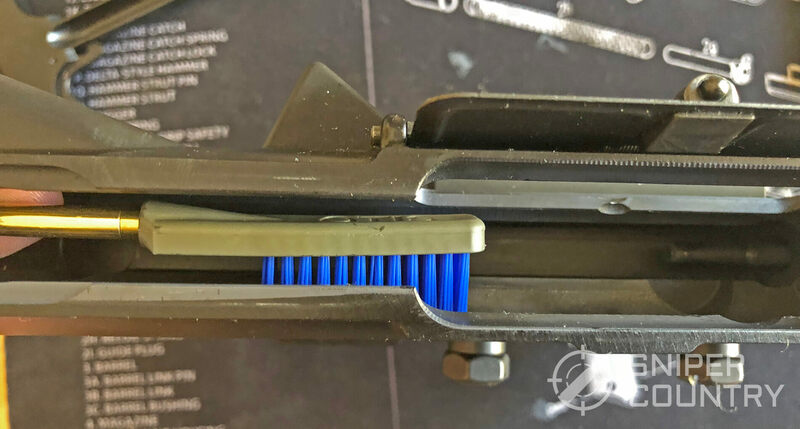 The jags also help prevent the rod itself from contacting the sides of the barrel, which has the potential to cause some wear if done repeatedly over time. Loops are included, if you prefer them over the jags. I like to use the loops for the initial solvent application, and then the jags for the post barrel brush carbon removal. Since the handle allows it to rotate, you’ll need to hold the rod itself rather than the handle when using the soft bristled brush attachment. The brush does a good job of removing stubborn or hard to reach carbon deposits. A little solvent or CLP can be applied if need be. 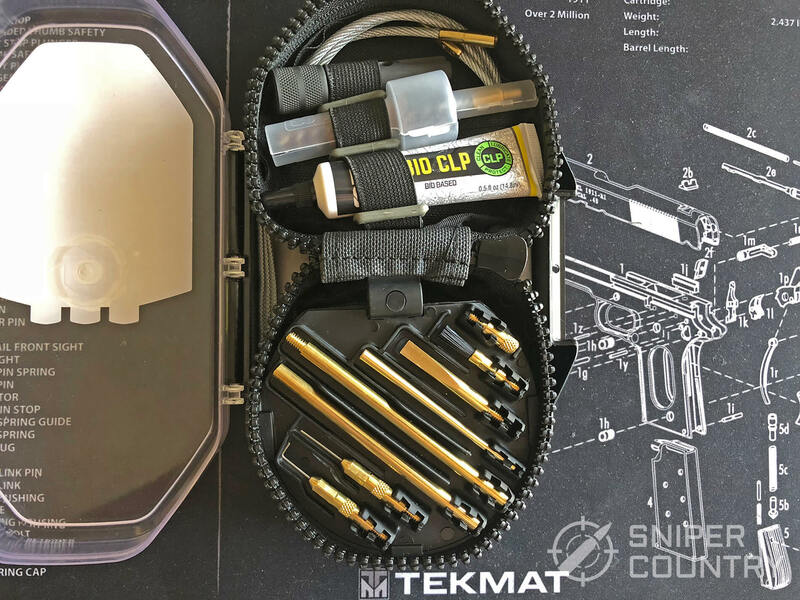 This is the perfect kit for those who own multiple handguns, and at a great price. The case has enough room for you to keep a small bottle of CLP in there too, so you can have everything you need in one place. 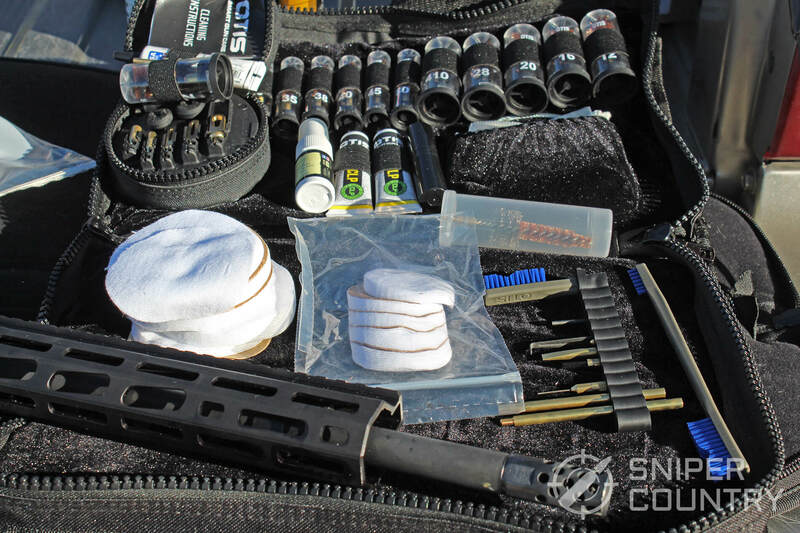 For gun owners with several different types of guns, one all-inclusive kit is a good way to go. 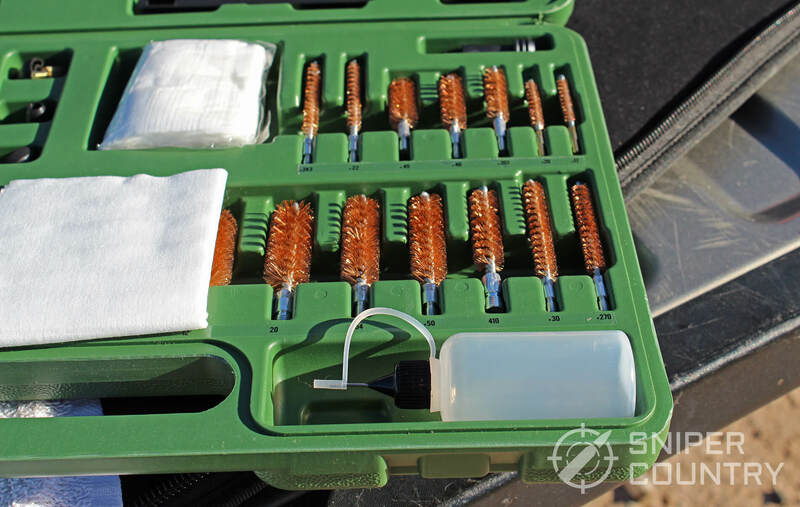 Gloryfire’s Universal gun cleaning kit is a great budget friendly multi-gun choice. 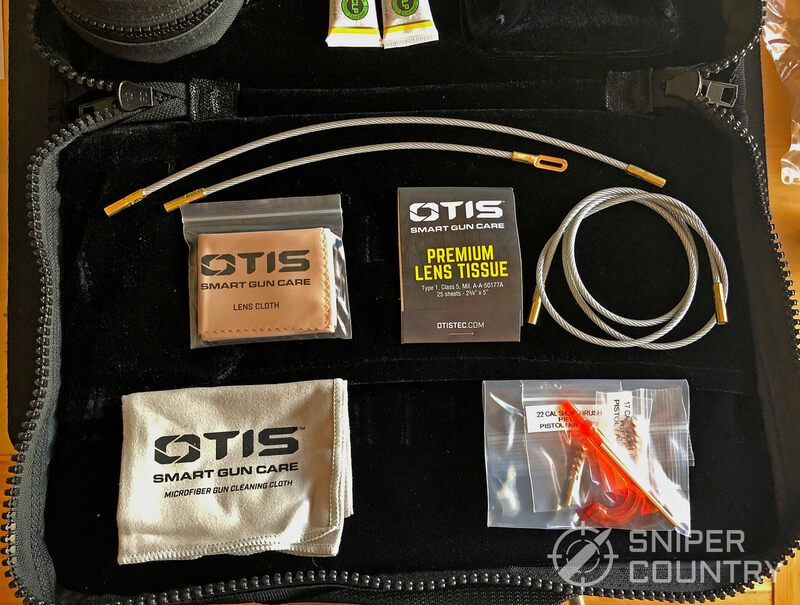 It’s a bit barebones when compared to the Otis universal kit, but for the price it fits squarely in the bang for your buck category. 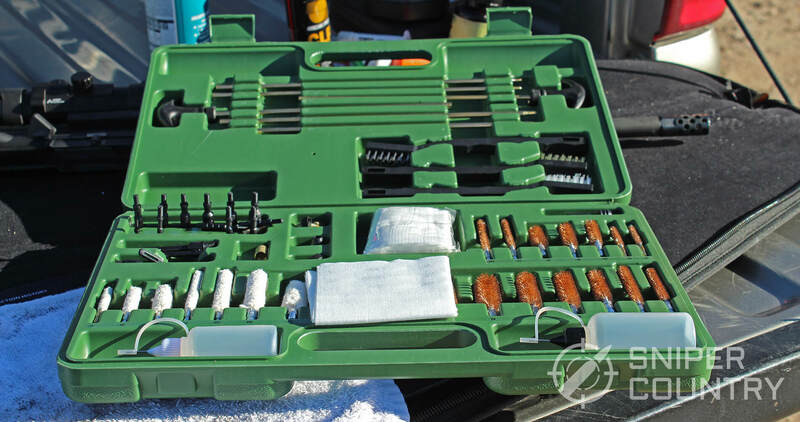 The kit is made in the USA, so the tools are higher quality than the price may suggest. It comes in a thin hard plastic case that should do a good job of protecting its contents. 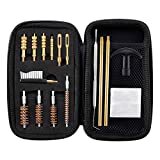 The bore brushes cover the full range of pistol, rifle and shotgun calibers, and has a mop set too. I noticed some complaints about the tools not having any labels on them, but they must’ve fixed that. Mine has caliber labels on the kit below the tool, and on the brushes themselves. The included picks show above have enough variety to be a good tool set, and the cotton tip applicators are nice touch. They don’t fit in the case though, so they need to be kept somewhere separately. This kit uses solid rods instead of flexible cables and includes two different sizes to choose from. That’s due to the different thread diameters of the brass brushes. There should be enough extensions to fit any barrel length. Two needle tip squeeze bottles are included that you can fill with your preferred lubricant and solvent. If you don’t have a preferred blend, you can check out our Gun Oil’s and Lubricants Article, which will help you narrow down your options. These bottles are stored sideways in the case, but that shouldn’t be a problem if the cap is on snuggly. The jags and eyes are plastic, which normally is a concern for me, but not for this kit. I’ve used plastic tools from other kits in the past that have broken, but these have proven to be durable. The spear tips on the smaller jags are tougher than they look, and the eyelets are flexible and flex substantially before cracking. I sacrificed one to test them. 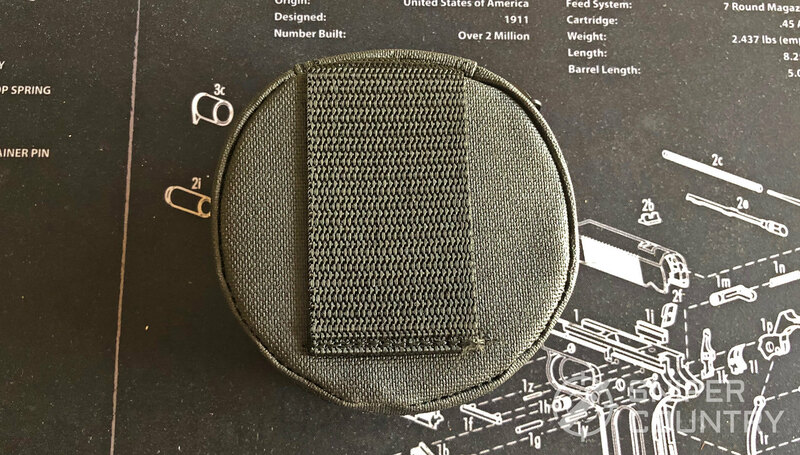 That said, eventually enough flexing can cause anything to break, so it would still be best to try and match up the eyelets as close to the barrel diameter as possible. It has cotton mops that match each barrel size, which you can use to swab or to coat the barrel with oil. I prefer to send one through with a light oil coating if it’s a gun I don’t shoot very often. The included brushes are nylon, brass and steel, so any spot in need of scrubbing should be covered. The steel brush may be too hard for some surfaces, so it’s probably a good idea to check before you go to town with it. They’re definitely big enough for you to get a firm grasp on it, but they’re still thin so should fit in most spots. 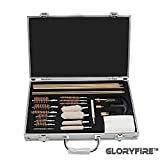 Gloryfire’s kit is also a good kit for replenishing an existing tool set. The number of bore brushes and jags you get for the price is cheaper than trying to buy extras of each brush individually. This is the best budget universal cleaning kit available, and is a great choice if you already have solvents and cleaners you prefer. 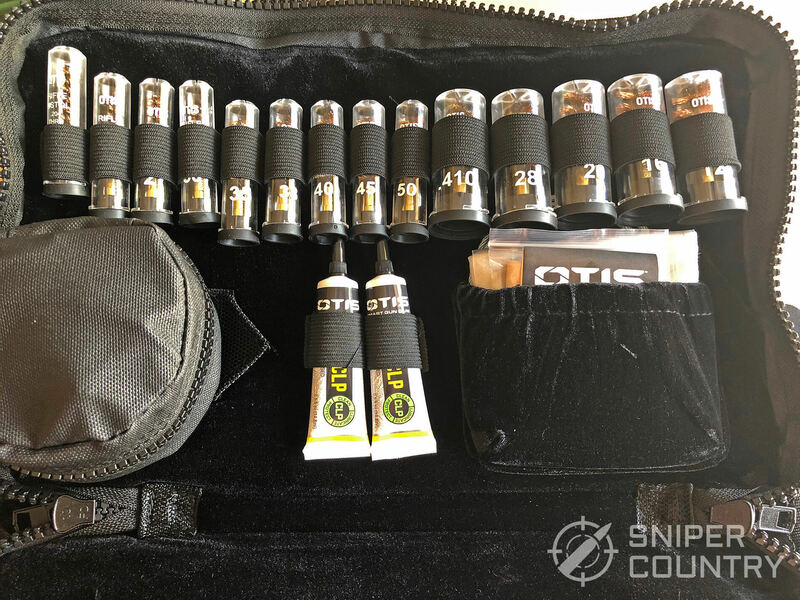 The Otis Technology Elite Cleaning kit has everything you need to clean pistols, rifles, and shotguns of any caliber. 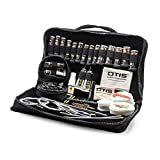 It’s very well thought out kit, which includes assortment of brushes, patches, and an expansive tool set. 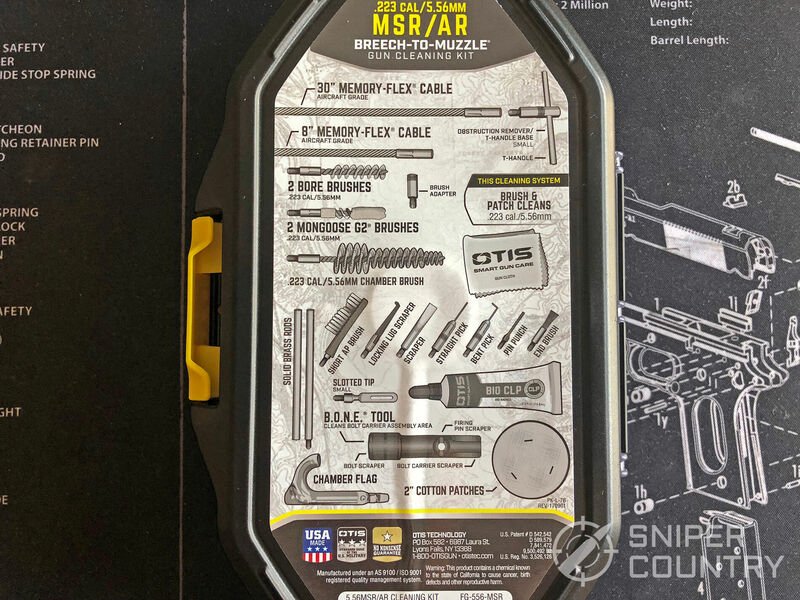 I would consider it as being a larger and all-encompassing version of their gun specific cleaning kits, like the AR/MSR kit which we touched on above, with a few extras. 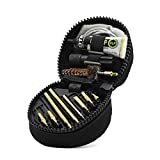 When compared to other universal cleaning kits, it includes a few items that help it stand out above the rest, like lens cleaning supplies, chamber brushes and a detachable mini-kit. I also like that it comes with multiple CLP bottles, so it really does have everything you need. 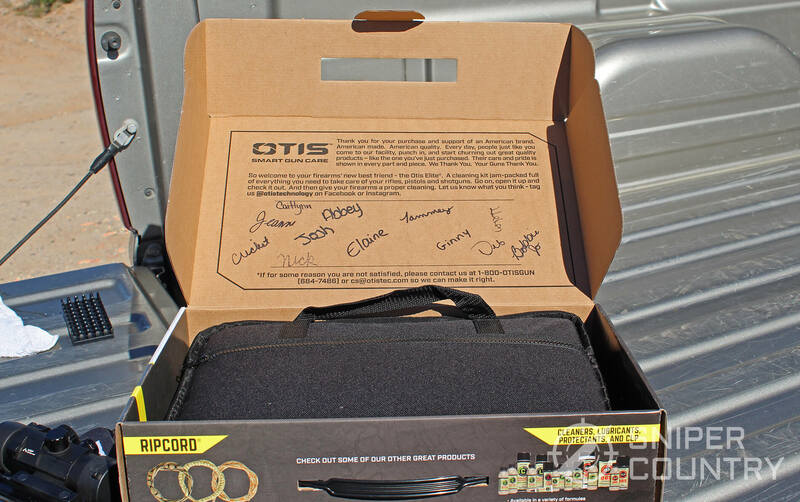 The box included signatures from the staff, which was a nice unexpected touch. All of the products we review are purchased by us and without any forewarning, which means they must do that for all who buy their Elite Cleaning kits. It has several pockets that are stuffed to the brim with more supplies. Each bore brush comes in its own separate tube, which keeps the kit clean and allows the brush to dry properly after use. It specifies what caliber it can be used for on the tube and the brush itself. The brush fits snuggly in the rubber grommet, so you can stand the brush up on the table. Like the MSR/AR kit, the Elite kit also uses the flexible cable design. It’s ideal for guns that would normally require using a bore snake, like my CZ Scorpion. It comes with multiple eyelet sizes and an assortment of different cleaning patches. The patches also have directions on how to attach them to the eyelet, and how big to fold them. It’s more effective than just passing it through the eyelet, and varying the size lets you choose how snugly you want the cloth to fit. 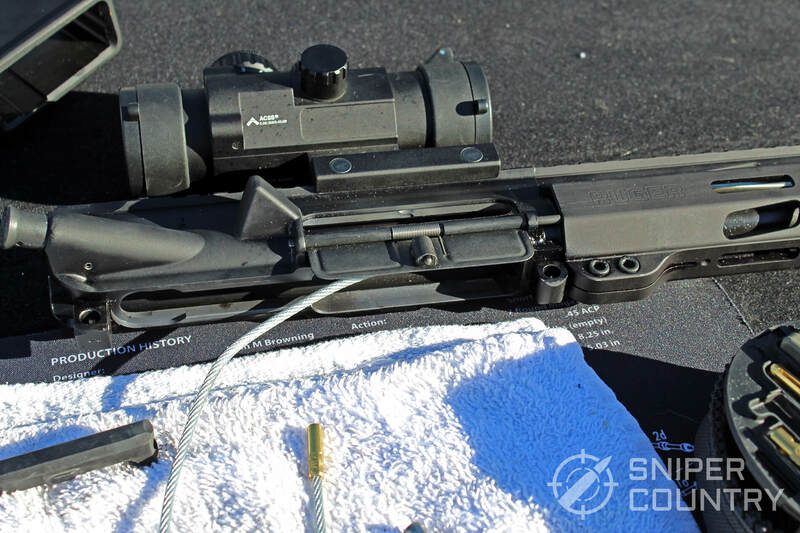 The flexible cable can be fed up through the upper receiver, or through the ejection port, and into the barrel. Since there’s no room for a solid rod on the Scorpion, it’s the perfect solution. Then you just pull on the cable to pull it through the barrel. It does take a little bit of force, like a regular rod or bore snake, but you can adjust how much by reducing the size of the patch. Since it’s folded, you can flip it over and reuse it. Everyone has their own preferred method, but I usually run one patch through dry and then one with solvent on it. I let it sit for a few minutes and then pull a brass brush through a few times to remove the more stubborn build up. After that I run dry patches through until its clean and dry. The optic lens cleaning brush, solution, cloth and tissues are a nice addition to the kit. 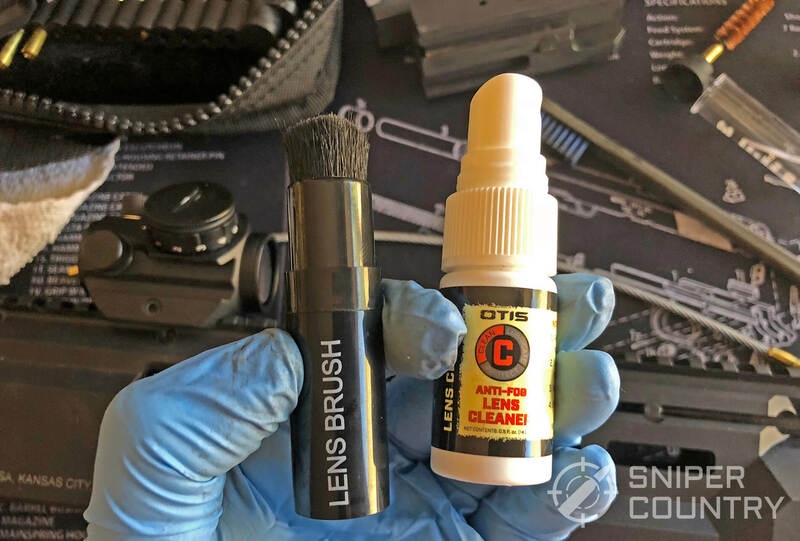 The lens brush is great for removing any dust that may have gotten on the lens and the cleaning spray is safe on all lens coatings. 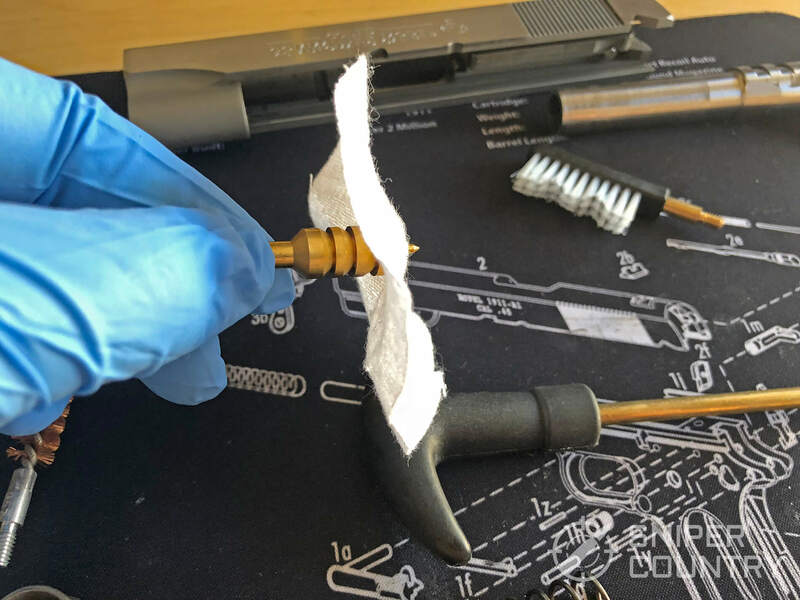 If you’re in a hurry and don’t have time for a full spray and wipe down with the included tissues, the included lens cleaning cloth work well too. 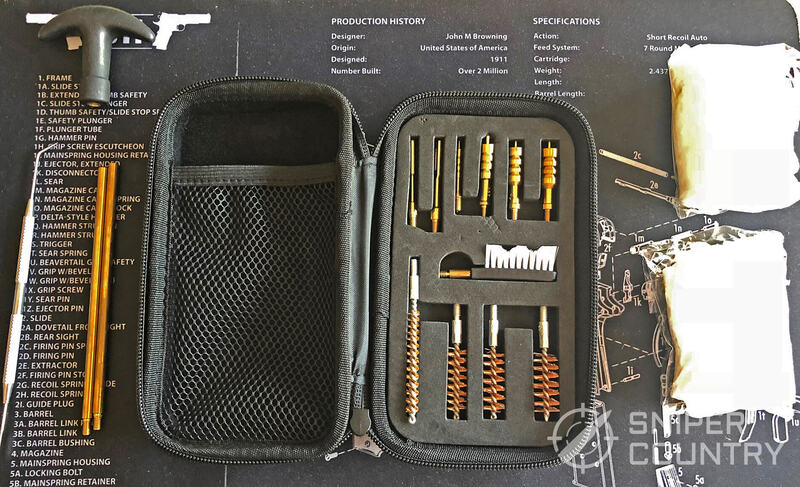 For gun owners with a large collection, or those that eventually plan to have one, this is a great kit that should last you a very long time. A clean gun is a happy gun. 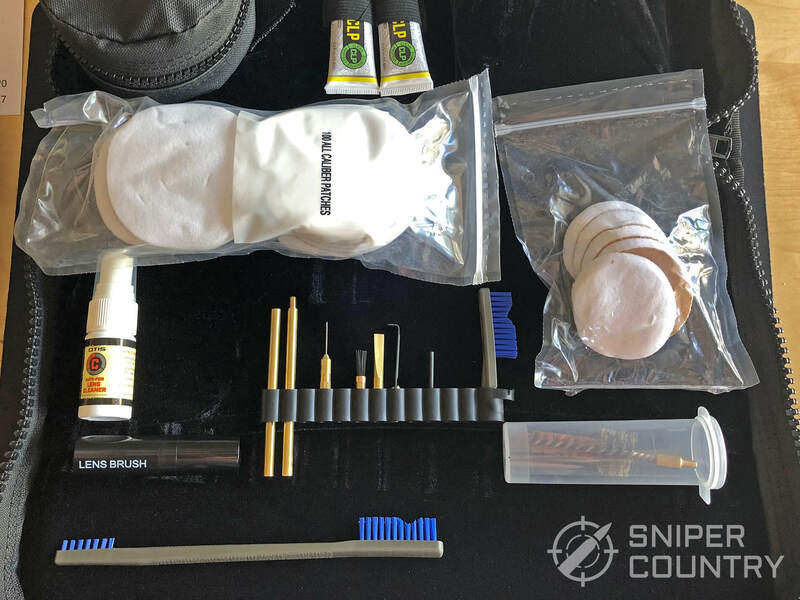 Whether you clean your gun after every range trip, or only when you notice a decrease in performance, a good cleaning kit will make a big difference. What cleaning kit do you like to use? Let us know in the comments below!